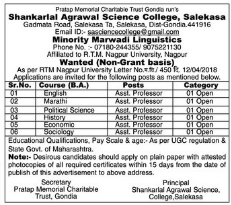 Shankarlal Agrawal Science College, Gondia has advertised in Lokmat newspaper for the recruitment of Assistant Professor jobs vacancies. Interested and eligible job aspirants are requested to apply with in 15 days. Check out further more details below. About College: Since its establishment way back in 2008 Shankarlal Agrawal Science College, Salekasa has been gradually progressing. Initially, we have only B.Sc. (C.B.Z.) course which is Granted by Rashtrasant Tukadoji Maharaj Nagpur University, Nagpur and now we have introduced various Non-grant courses such as B.Sc.(P.C.M. ), B.Sc.(Com.Sci.) & B.A. ie. Arts faculty also, so the students of this remote area have lot of options to choose. We are further planning to introduced job oriented courses in the college and always been committed to cater quality education & overall development of the students.